Thank you for joining us for this, the first of two, semi-final debates. The next couple of weeks will see the field narrowed down to two candidates. You've heard them previously speaking on political issues and what they stand for. So this time around, we're going to get a little more intimate and get to know these candidates for who they are when they're not trying to save the world through legislation. Soph: Please call me Soph. Soph: Yes. No need to be formal. TNR: That's an unusual pronunciation. Soph: Oh, well, it's Indonesian. TNR: Soph, let me ask you, what makes you, you? Soph: I'm a hoverer. Most pterodactyls like to soar high above, out of sight. Me, I like to be low to the ground. Anything higher than 20 ft and I start to get queasy. But I feel this has kept me a little more grounded in life -if you'll pardon the pun. I've stayed in contact with people; which is really who I am... A people person. TNR: Tell me, what's a typical day like in the Bochs house? Soph: Up early, getting the kids ready for school. My two oldest are hunting for themselves now, but the youngest still requires her mummy to get her some food, pre-digest it, and then vomit it into her mouth. TNR: Kind of an Alicia Silverstone thing. TNR: Did you just say Egg-zactly? Soph: I don't think so. Anyway, once they're dropped off at school and a sitter is set for my baby, I'm off to work. For the past few years I've hosted a radio program broadcast in Alaska and parts of Michigan. Perhaps you've heard of it, it's called 'The Bridge to Somewhere'? It's a call in show where we hash out everything going on in Washington and the rest of the world. After the show, I usually stop off and do a little hunting for dinner, spend some quality time with the kids; maybe catch a movie on TV, and then off to bed. Soph: There is no Mr. Bochs. I've had three brief flings with a guy named George, after which he always leaves before the children are born. Soph: No it's sweet really. If he stayed, he'd only end up eating the children. TNR: Thank you for joining us Soph. TNR: Hello and welcome Jeff. Jeff: Please, call me Soap. TNR: Haha, I think I'll stick with Jeff. Jeff: Probably for the best. What kind of parent names their kid Soap? My parents left me when I was still an egg, but at least they named me Jeff. TNR: Now, now, this isn't a place for attacks. Jeff: My apologies. I was just befuddled by that. TNR: Jeff, what makes you, you? Jeff: I didn't have a lot to look forward to when I was growing up. Half the time I was running from one predator or another. When I finally got old enough to make something of myself, I did just that. Invented a device that helps dinosaurs with short arms reach things. Sold like hot cakes and lifted me out of the gutter. TNR: Sort of a self made dinosaur? Jeff: Not my favorite term, but I'll wear it. TNR: What's a typical day like for you. Jeff: I wake up, live my life, and then go to sleep. Life shouldn't have typical days. Every day should be new and full of promise to be original and fresh. Just as example, two days ago, I'm in Alaska mountain climbing. Last night I'm at home dining on a pterodactyl baby. Today I'm chatting with you. Life is to be lived. Soph: Alaska? Pterodactyl baby?? What mountain?! TNR: Jeff... Did you eat her baby? Jeff: Dude, please, who do you think we are? Both Soph and I are carnivores. Don't ask me to hide who I am. Have I been anything but upfront about that? TNR: No, you've been pretty honest. I guess I can't fault you for that. Soph: Can't fault him?! He. Ate. My. Baby! Jeff: Nothing that millions of Americans wouldn't do on Thanksgiving. Soph: I've got to go see the rest of my children. I'm out of here. TNR: And so are we. My guests have been Ms. Soph Bochs, and Jeff. Thank you both for coming. Jeff: She's already gone? How rude. Thank you for having me. So who will it be? Two carnivores, but only one can stand on top of the food chain. You have one week to decide. Voting ends next Monday at 11:59 pm. Then on Tueday, the two last candidates, will dance. Hilarious! I like Jeff. He just reduced the surplus population. I think Jeff's mealtime backfired on him...I'm giving Soph my pity vote for possibly losing a child to the opposition. We just got dinos cloned, and Jeff's already eating them? Oh well, it was going to be a pterodactyl whose mom hadn't taught it to fly, anyway, and what kind of an example is that for lazy kids? They'll think that if they don't want to learn how to walk, they won't have to. 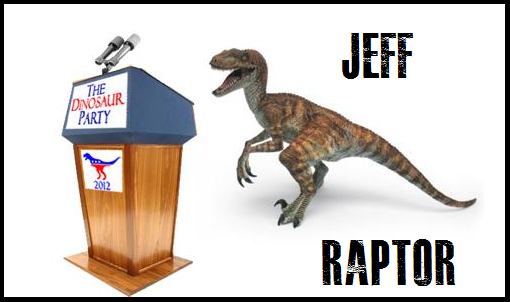 I guess I'll go ahead and vote for Jeff anyway, then. When Jeff also said "call me Soap," he had my vote. Gotta love a candidate with a sense of humor. 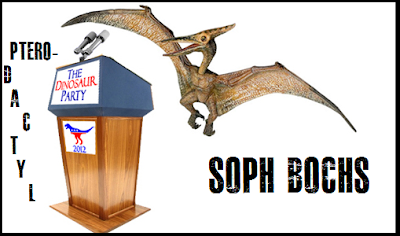 Soph needs a vote for sure, she hovers plus lost a baby, major tear jerker of a vote for me.